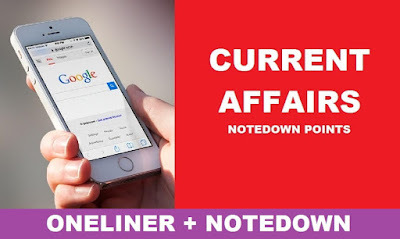 In the Current Affairs & GK Update of 10 August 2018 we cover all important National,International,Financial,Sports news, nominations, agreements which are relevant for upcoming SBI PO,SBI Clerk,SSC,IBPS RRB exams.We at Achieversrule regularly provide One Liner Current Affairs and GK Updates to keep our candidates prepared for Current Affairs section of Banking,Insurance exams and current affairs exam. Prime Minister Narendra Modi will be the Chief Guest for the inaugural session of the World Biofuel Day programme. The 11th edition of Global Innovation Index (GII) 2018 was launched in India on August 8, 2018. The index was based on the theme– ‘Energizing the World with Innovation’.The India launch was organised by the Confederation of Indian Industry (CII), one of the founding partners of GII along with the World Intellectual Property Organization (WIPO) in collaboration with the Department of Industrial Policy and Promotion (DIPP). An official statement said that the World Biofuel Day is observed every year on August 10 to create awareness about the importance of non-fossil fuels as an alternative to conventional fossil fuels.The World Biofuel Day is being observed by the Ministry of Petroleum & Natural Gas for the last three years. Google has launched a new video-based Q&A app called 'Cameos' on the App Store, which allows people to answer questions about themselves, then share those answers directly on Google. HSBC has launched a new digital platform 'My Deal' to simplify capital raising process through capital markets by providing real-time access to information such as investors’ feedback, profiles, client orders and deal pricing. In its pilot phase, MyDeal has raised over $25 billion in the first seven months through over 30 transactions globally. Javelin thrower star Neeraj Chopra will be India’s flag bearer in the opening ceremony of the upcoming Asian Games 2018.Chopra, who won the gold medal in Commonwealth Games 2018 event in Gold Coast earlier this year. Australian professional golfer Jarrod Lyle has died after a long battle with cancer, aged 36.The Shepperton pro-golfer was first diagnosed with leukaemia at the age of 17 and was confined to a bed for nine months while having chemotherapy treatment at Melbourne’s Royal Children’s Hospital. NITI-National Institution for Transforming India. Vice-Chairman of NITI Aayog- Rajiv Kumar. CEO of NITI Aayog- Amitabh Kant. Headquarter of HSBC bank: London,United Kingdom. Chief executive Officer of HSBC India:Surendra Rosha. CEO of Google: Sundar Pichai. Headquarter of Google: California,United States. President of Indian Olympic Association:Narinder Batra.